October | 2014 | WorstPlans.com updates every Monday! The issue: Most social networks only allow you to “friend” or “unfriend” a person—a binary choice. Although a few networks have additional degrees of granularity (“co-workers” / “show only my public profile”), in general it is assumed that the relationship between individuals is symmetrical. Fig 1: The familiar but insufficiently expressive “friend” button. We can label these buttons “stalk” and “vendetta” respectively, and greatly increase the amount of information available for data-mining in the relationship graph! Fig 2: Additional buttons in action. Now we have captured crucial but previously-ignored information between individuals! PROS: Increases ability of social networks to capture the complex relationships between individuals. CONS: None, this is a great idea that your Internet-enabled business should implement immediately. Soccer matches have a very high probability of ending in a draw. In the few cases in which a draw is not allowed as a final outcome of a match, the game will (eventually) go to a one-on-one penalty kick shootout. This method of resolution uses a very different skill set from the main game, and is one-on-one rather than being a team game. Taken to the extreme, one could resolve a tie by just flipping a coin, or perhaps choosing two players to face off in a game of checkers or other unrelated game. However, it might be more satisfying for spectators if a match could be resolved using a team-play-based method. 1) “Multi-ball” (inspired by pinball). Every 10 minutes, an additional ball is added to the field. The off-sides rule is temporarily suspended. Fig 1: The “multiball” method is played on the standard field. 2) Goal distance reduction: every 5 minutes, both goals are moved 10 feet closer to the center line. Field markings remain unchanged, and play remains the same otherwise. 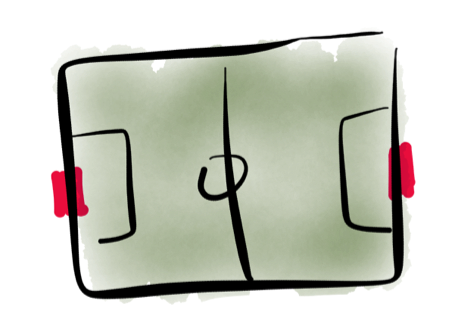 The corner kick would presumably require some modification. Fig 2: The goals, represented in red, are moved inward periodically, until the tie is broken. 3) “Multi-field”: the field is split into four smaller fields, and each team is allowed to assign 4 players per mini-field. The game could continue for a fixed period of time, or be “sudden death” depending on how much time is considered acceptable for the tiebreaker. Fig 3: The “multi-field” method in action. Perhaps barriers between the fields could prevent the games from interfering with each other? Or maybe that would be part of the game. PROS: Would definitely make tie matches much more bizarre and interesting. Prevents important games from being determined by the penalty shootout. CONS: May require significant persuasion to convince fans! Purists would undoubtedly be disappointed. As all visitors of Youtube (or any site that allows user interaction) are aware, it is difficult to have a “comments” section that isn’t populated with incredibly horrifying contents. 1. Do nothing. Disadvantage: spam / scams overrun the site, making it totally un-usable for legitimate users. 2. Ban / block unusually abhorrent users. Disadvantage: they can just re-register. 3. Require real names of users. Disadvantage: severely restricts discussion of any controversial topics (a “chilling effect”) where users may not want to publicize their opinions. 4. “Hellban” a user (a “hellbanned” or “shadow-banned” user’s comments are not visible to other users). Disadvantage: the user may become suspicious when none of their comments are ever remarked upon. Then the user may register a new account. Let us start by just plain “hellbanning” a user (hiding their comments from other users), but also add in several chat bots that personally interact with each hellbanned user. This will simulate normal chat / commenting behavior. We propose to refer to this as “robo-banning,” since the banned user can, henceforth, only communicate with chat bots (“robots”), and no longer with any real users. The chat bots could come in various types with different personality traits and political beliefs. These could even be tailored on a per-individual basis (for example, a chat-bot could be selected with the opposite political beliefs of the robo-banned user). The idea would be to occupy as much of the “robo-banned” user’s time as possible in talking to the chat bots, so they wouldn’t annoy the real users. PROS: Would be highly entertaining. Interactions between “robo-banned” users and the bots that they argue with could be posted for the amusement of others. Pet ownership can sometimes be problematic in today’s mobile society. For example: if a person has to leave on a business trip and doesn’t have friends or family to take care of their dog / cat / capybara / etc., they have to deal with the hassle of kenneling their treasured beast. This can be expensive for the owner and unpleasant for the animal in question! There are some frogs that can apparently survive in a state of suspended animation at near-freezing temperatures. Also, bears are known to hibernate for months in the winter. A “Freeze-A-Pet” would be a regular pet, except that it can hibernate when exposed to cold temperatures. Presumably this type of pet could be created using the same “insert frog DNA into animal” technology used to create the dinosaurs in Jurassic Park. Easy! Fig 1. A photorealistic rendering of a “freeze-a-pet”-compatible cat. Not pictured: frog DNA. So if a person needs to go on out of town for a while, they just stick their pet into their freezer (or perhaps fridge), and the pet hibernates until the owner returns. Problem solved! Fig 2. Artist’s rendition of a freeze-a-pet in hibernation, Han-Solo-style. In the event of a power outage, the fridge could be programmed to pop the door open and (optionally) send a text message and/or sound an audible alarm. PROS: Makes pet ownership much more feasible for busy individuals. CONS: The kennel lobby (“Big Kennel”) would probably oppose any development in this field, which might make it hard to find funding and avoid regulatory hurdles.